On Saturday, we held Scarlett's Birthday Blood Drive! It was an amazing event, and we were blown away by the response from our community, blog readers, friends and family. We were graced with beautiful weather, ample volunteers and more donations (both of blood and goodies!) than we knew what to do with. The final count was....129 donors with 103 units of blood!!!!! We far surpassed the paltry 50 units that we originally targeted, and even the 100 that we secretly hoped we would hit! We know that many of you tried so hard to donate but couldn't (more iron next year, mom!) and we want you all to know that we were so happy that you tried! Thanks to everyone, we had one of the biggest patient drives the Stanford Blood Center has ever done! Thanks to Krista Davis, who took pictures for us throughout the day! We had a ton of food for everyone who came, thanks to Dino's Grill, Let's Cupcake and Jennifer Jones. I think I ate enough cake to last me a year! A last-minute donation of a helium tank definitely spruced up the place! We had about 25 raffle items thanks to our blog readers and community! From gift baskets, homemade jam, and some nifty kitchen gadgets to the highly coveted Toys R Us gift cards and an iPod Nano, we made sure every donor got a chance to win! Plus, since it was such great stuff, we let people buy additional tickets. We made a $142 donation to the Pediatric Brain Tumor Foundation in Scarlett's name. Thankfully, Scarlett's cousin Caleb has waited to make his appearance until AFTER the blood drive! We had eager donors ready to go at the stroke of ten, and the line did not stop until 4, when we sadly had to start turning away walk-ins. The blood center staff ran out of supplies twice! At one point, the wait was over an hour...sorry, guys! It was for a good cause! Chris has very efficient veins, so he was in and out! I am always a slow and steady dripper...it took a while, but I did a whole unit and didn't pass out this time! Scarlett's great grandma donates every 8 weeks! Uncle Mike was pretty nervous...he thought he would be at work, but got to donate instead! We kept all ten donation chairs full for 7 hours straight. Everyone enjoyed snacks as they recovered from donation. We only had two faint, so I think we did a pretty good job! Chris and his friend Mark entertained us all with karaoke throughout the day...next year maybe someone else will join in! Thank you again to everyone who came out, and especially to those who hung out all day to help us set up, keep everything running and then breakdown (three hours later than we had planned!) 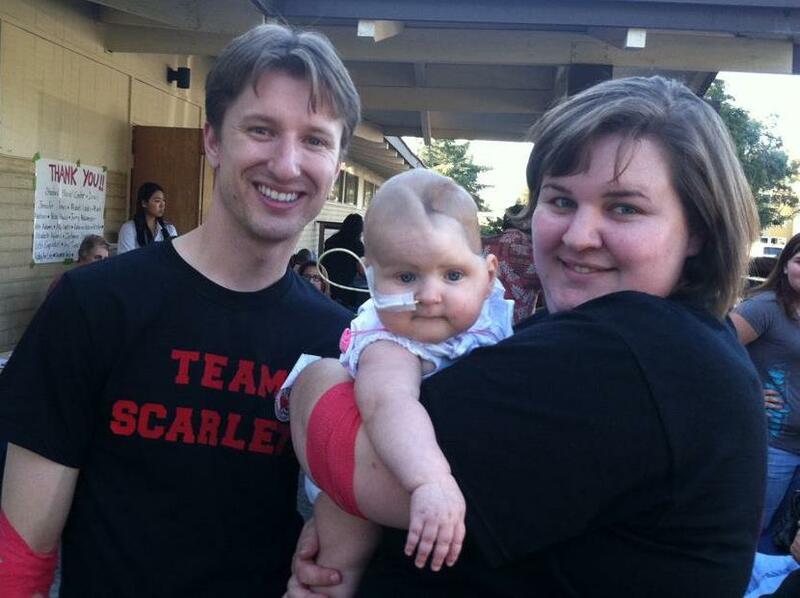 Kids like Scarlett and patients all over owe their lives to blood donors like you! Is there any better feeling than that? We already have a plan brewing for next year...double or nothing! P.S. Check out my newest project....product reviewer and editor at BabyGizmo! My sister and I have both used BG as we shop for baby gear over the last year. I'm excited to share what has worked for us over the last year, and especially those things that other kids with special needs might benefit from! Check out BabyGizmo's blog, Rated by Mom, to see my latest review of Scarlett's must-have paci, the Wubbanub! Congrats on a successful blood drive! I'm all the way in Nebraska and would have loved to donate but I'm pregnant! Next time I get to the blood bank I will mentally give in Scarlett's honor! Congratulations!! Looks like it was a great success! I was glad to do it! I wrote up MY version of the blood drive in my blog. Is the room spinning? P.S. I am already hydrating getting ready for next year! Wow, the blood drive was a huge success! Good job to both you and Chris for planning such a successful and necessary event. Little Scarlett is such a special little girl.